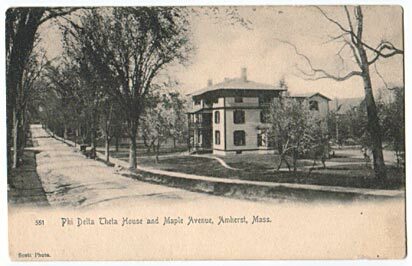 The Massachusetts Beta Chapter of Phi Delta Theta was chartered at Amherst in 1888. 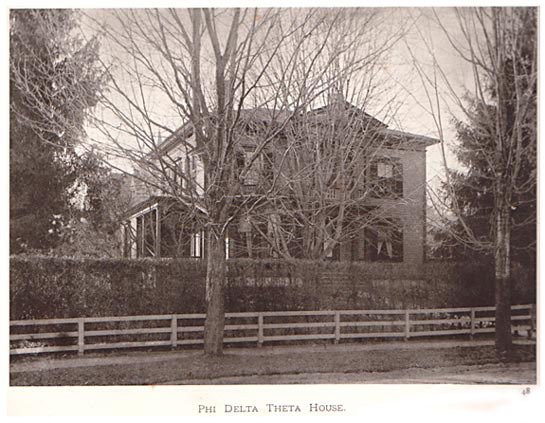 This building stood where the Converse parking lot now stands, and the College bought the property and building from the fraternity in 1912 for $22,500 and a plot of land for a new house. The fraternity used the sale to fund the new house, just west of College Hall (King, 154). The picture below is from the book Sunlight Pictures: Amherst, a collection of artotypes by E. Bierstadt from original negatives by Edward P. Harris.